In 2002, I attended a meeting of the newly-formed, Tourism Innovation Group, in the laid-back surroundings of the Birnam Arts Centre, in beautiful Highland Perthshire. Early in the proceedings, I met a lady called Freda, introduced myself and asked her what she did. “I’ve just bought a boat!” she replied. That lady was Freda Newton, and the “boat” was a cruiser on Loch Ness. 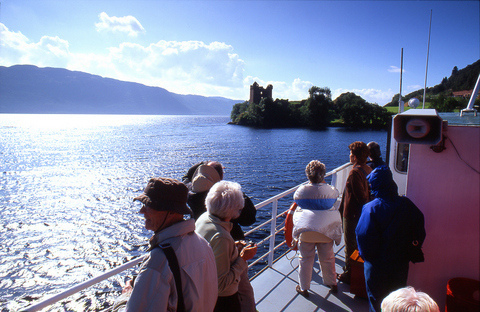 In short order, the boat became a fleet, re-branded as Jacobite Cruises (later, Loch Ness by Jacobite), and was transformed into a five star experience, worthy of the worldwide appeal of the opportunity to hunt for Nessie. Through an innovative approach to the experience of cruising on the Loch, coupled with strong branding and marketing, Jacobite soon saw passenger numbers treble and the business goes from strength to strength. TripAdvisor reviews confirm that passengers appreciate the friendliness of the Team, the information provision, the all-weather comfort and the high housekeeping standards. I was reminded of the Jacobite Experience last weekend, when I made a short round trip on the Thames Clippers service, from London Bridge to Tower Pier. Having lived and worked in London and made fairly regular use of the Thames Clippers, I have long felt that there is something missing from the experience: dare I say it, it is that “E”-word again – ENTHUSIASM! The service is owned by the entertainment conglomerate AEG (which also owns The O2). According to its recruitment website “AEG has one underlying aim……’To give the world a reason to cheer! '” This is a great and laudable aim, and having worked at The O2 I know that Guest Service is felt to be important – indeed, The O2 itself raised the bar for Service at UK live venues when it opened in 2007. The Thames Clippers experience, however, does not currently give one “reasons to cheer”. Sharing, as it does, piers with other operators, there seems to be very little cross-fertilisation and the provision of information is fairly basic. At the busy Tower pier, for example, there were at least three queues, snaking around one another, and when a boat arrived, unscheduled, at the far end from us, a crew member announced its destination without any voice amplification, meaning we could not hear him. The Thames Clippers are certainly beautiful, powerful boats, and serve Costa coffee to boot! Yet, there is only perfunctory engagement between passengers and crew: no information about places of interest along the route (other than TV screens showing silent images and advertising), travel and safety announcements made curtly and too often, an absence of basic warmth. No smiles! By contrast again, when we were designing the Passenger Experience for the Emirates Air Line Cable Car, linking The O2 and ExCel arenas, we set out to create “Inspiring Journeys“, and we did so by ensuring that the Service style informed the way everything was done – from safety procedures to ticket sales and information provision. We were so successful that within three months the cable car received the accolade of best passenger experience across the Transport for London network. So, I suggest that Thames Clippers miss a trick by not appearing to focus on Service. If they did so they would properly engage with their passengers and gain better reviews, higher propensity to recommend and even enhanced sales of Costa coffee! To refer to our Service Excellence Model, having a great Setting – lovely boats on the lovely River Thames – is not enough on its own to create a WOW-factor for passengers. Designing the Passenger Experience to bring the Setting to life, and exceed expectations in the most memorable way, should not be beyond AEG – and it would be good business! Discover more about the Service Excellence Model and how it could benefit your business here.